Viscose factory that claims to be environmentally friendly has been fined several times over illegal dumping of sewage and toxic waste straight into nearby river. Viscose (or rayon) has often been marketed as a more ecologically sustainable alternative to polyester because unlike polyester which is made from petrochemicals, viscose is made from cellulose. It is also praised by some fashion brands because it requires less water to produce compared with cotton. Viscose is found in a huge variety of clothes and is used by almost every major fashion brand to some extent. Although not inherently unsustainable, it is the production process of viscose that presents a very problematic story. Basically, wood pulp is extracted from wood, then turned into viscose staple fibre (VSF) and filament yarn through a highly chemical process using carbon disulphide. Viscose production faces a three pronged issue: the risk of deforestation of ancient forests, occupational hazards of factory workers who are exposed to highly dangerous toxins that have been linked to neurological damage, and heavy contamination that results from poor waste management of viscose factories, not only polluting nearby waters and air, but causing widespread illnesses to villagers in the vicinity of factories . Sateri Holdings is a Chinese company and one of the largest cellulose producers in the world; they have 4 plants across China, owned by different entities . The viscose plant in Hukou county was acquired by Sateri (Jiujiang) Fibre Co. Ltd. in 2015 and is located at the banks of Yangtze river . The plant is located in an industrial park and there are no villages or residential areas in close proximity to the plant . Sateri (Jiujiang) Chemical Fibre Co. Ltd. is part of the Canopy Style commitment (mainly commitments in regards to not sourcing wood pulp from ancient or endangered forests) and brands buying viscose from this plant include “H&M (Sweden), Zara/Inditex (Spain), Marks & Spencer (UK) and Tesco (UK)” . It shall be noted that in the case of industrial pollution in China, often times it is very difficult for local communities to mobilise or protest. Polluting industries bring economic activity and employment to local towns, so villagers are most of the time highly dependent on the industrial activity. Furthermore, it is not uncommon that companies hire security in order to ensure that journalists and investigators cannot report on any wrongdoings of the factories. Corruption and support from secretive governments is another reason that makes it very difficult for residents to stand up for their rights. Over the course of two years in 2015 and 2016, Sateri Jiujiang Chemical co. was fined at least seven times due to breaching environmental regulations by discharging untreated wastewater into the river (which the company claims not to do) . 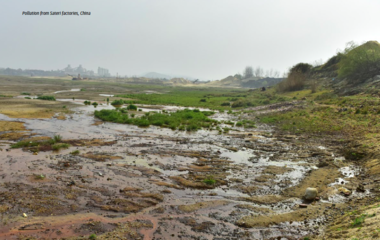 In February of 2016, investigators observed Sateri Jiujiang discharging sewage into the Yangtze River, and a very clear area of thick black pollution coming from the factory was observed in the river . It was also discovered that the company had been burying waste pipes, and as a result Sateri Jiujiang was ordered to suspend their viscose production and fined 5.697 million yuan (roughly 860,645 USD). Their senior management were also placed in detention for 10 days as a penalty . Sateri (Jiujiang) Chemical Co. advertise themselves as being a green and environmentally conscious company, yet it was found that they had been engaging in particularly polluting activities at night, in secret . Newspaper investigators observed a level of zinc in the nearby river at a concentration 1000 times higher than the permitted limit . 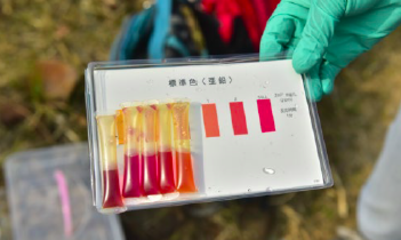 Sateri claims to be a sustainable and responsible corporation who “adhere to all local regulations, all effluent is treated properly and our emissions are far below the industry standards set by the Chinese government.” . They continue to describe their commitment to sustainability and community awareness through on their website as follows: “Sustainability extends to communities. Beyond creating jobs and a value chain of suppliers, Sateri’s community efforts include donating thousands of library books, helping with disaster relief, supporting cultural activities and conducting environmental awareness training.” . A Chinese newspaper spoke to several local residents from different parts along the Yangtze River who mentioned a terrible rotten egg smell reaching their residents - this is a common trait of pollution coming from viscose factories . Some villagers mentioned the bad smell caused people to vomit. In 2011, many villagers living along Yangtze river fell ill with symptoms such as chest tightness and vomiting . It is widely believed that such illnesses are caused by industrial pollution, however because there are several different industries operating in the same area, it is too difficult to prove what exactly villagers are getting sick from . Project Details Sateri (Jiujiang) Fibre Co Ltd acquired this mill from Jiangxi Longda in 2015. They are currently planning a major expansion of 105,000 tonnes. The plant was built with an investment of 11 billion RMB . Why? Explain briefly. The company has been fined several times, but there is no evidence that they have stopped polluting the river and air. "Jiangxi Liuguo Chemical Industry and 12 Other Companies Fined for Environmental Law Violation"